Fresh raspberry sorbet in 30 minutes! A perfect frozen creamy treat for cooling down this summer! My mother’s birthday was a few weeks ago and all of the kids pitched in to help with dinner at my parents house. I was assigned: dessert. No problem-o here, I have a plethora of desserts to make and new ones to try! I had a few ideas brewing in the back of my mind (one of them involving a take on triple berry cobbler, shh!) but then my mom asked for something specific. 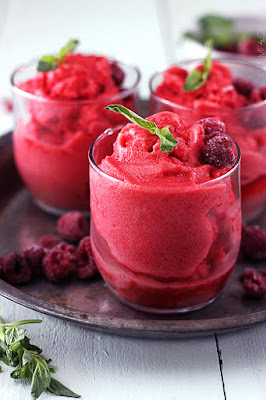 Raspberry Sorbet. Oh…. sure mom! I mean it’s her birthday, what’re ya gonna do?? Add water and raspberries to a food processor. Pulse until mixture has a smooth consistency. Freeze according to your ice cream maker's instructions. Serve immediately for a soft-serve dessert OR transfer to a shallow container and freeze an additional 1-2 hours for a more firm sorbet. 0 Response to "RASPBERRY SORBET"